Making Rose used to be an afterthought. But it is different now. 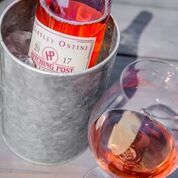 We take rose making very seriously, and pick grapes with the specific intention to make a naturally lively and crisp beverage that is light and quaffable, but has the structure to match well with lighter foods. We were again blessed with a compressed harvest where Valdiguie from French Camp near Shandon in warm northern San Luis Obispo County was ready at the same time as Pinot Noir from Rio Vista and Kick On in Santa Barbara. The Valdiguie was picked early and pressed especially for this rose. The free run Pinot juice was removed as the grapes were being crushed for red wine fermentation, and this 80% Valdiguie, 20% Pinot Noir came together before fermentation. We fermented long, slow, and cool in stainless steel, and put half in barrel to age on its lees until March, when we bottled this fresh and delicious preview to the 2017 harvest. Enjoy now and as it continues to develop over the next year or two.